We’re pleased to welcome James Grahame to CDM; James is the editor of the fantastic Retro Thing blog as well as the owner of the music electronics company Reflex Audio. James is a master of finding value in vintage gear, even recently pre-owned equipment. Here, he tells us how to get some DSP muscle in our music systems for a lot less money. -Ed. There comes a point in every electronic musicianÃƒÂ¢Ã¢â€šÂ¬™s life when they run out of computing power. It usually happens while adding the last track to an earth-shattering magnum opus. Most of us respond by dreaming of shiny new multi-core machines, but there is a clever alternative: Add an affordable second-hand Digital Signal Processing (DSP) card to share the workload. There are several top-notch DSP audio cards on the market including the TC Electronic Powercore series, the Universal Audio UAD-1e and the Creamware Scope series. Each card offers from one to 14 dedicated DSP chips to generate real-time effects and virtual instruments without taxing your computerÃƒÂ¢Ã¢â€šÂ¬™s processor. The only problem is the price ÃƒÂ¢Ã¢â€šÂ¬“ expect to pay at least $1000 for a reasonable combination of hardware and software plug-ins. Luckily, there are some great second-hand bargains out there. Used Creamware Scope cards currently offer the best bang for the buck (or euro, if that’s your persuasion). They were first introduced as the Pulsar series in the late 1990s. The hardware has remained stable for a few years, which means there is a good supply of used cards available for as little as $100. The current line-up consists of Scope Home (3 SHARC DSP chips and audio I/O), Scope Project (6 SHARC DSP chips with audio I/O) and Scope Professional (14 SHARC DSP chips, audio I/O and a really large plug-in library). 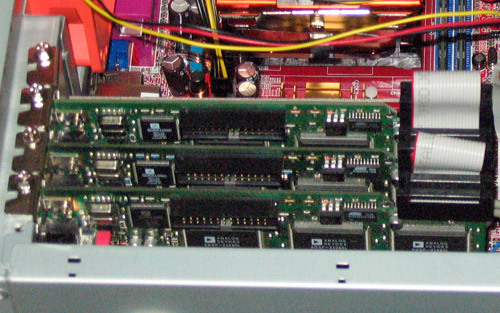 Up to three Scope cards can be installed in a single computer. They can be linked using a proprietary Z-Link cable [update: it’s actually an STDM cable] to create a single seamless DSP system that doesnÃƒÂ¢Ã¢â€šÂ¬™t tax your machineÃƒÂ¢Ã¢â€šÂ¬™s PCI bus. This makes it possible to purchase any combination of up to three Scope cards to expand your system from an affordable 3 DSP starter package into something frighteningly powerful. Used Scope cards are inexpensive if you know where to look. YouÃƒÂ¢Ã¢â€šÂ¬™ll find the occasional bargain on eBay, but by far the best spot seems to be the impressive Planet Z forums. This is the Creamware user community. The ÃƒÂ¢Ã¢â€šÂ¬Ã‹Å“Scope PurchasingÃƒÂ¢Ã¢â€šÂ¬™ sub-forum is home to some great deals. If youÃƒÂ¢Ã¢â€šÂ¬™re patient, you should be able to pick up a used Scope Project (previously known as the Pulsar 2) for as little as $300, and I recently picked up a Scope Home (formerly sold as the Luna II, Elektra Modular and Powersampler) for a mere $100. My Creamware system consists of three Scope Home cards with a total of nine SHARC DSP chips (yes, that’s it in the gloriously amateurish photo). ItÃƒÂ¢Ã¢â€šÂ¬™s easily capable of running a handful of softsynths and effects. I paid less than $400 for the hardware and upgraded to the latest software ÃƒÂ¢Ã¢â€šÂ¬“ Scope 4.5 ÃƒÂ¢Ã¢â€šÂ¬“ for an additional 98 euros (the upgrade is now 198 euros, with your choice of a free extra plug-in). This software gives me 57 different effects that range from reverbs to vocoders along with 12 synthesizers, a sampler and six different mixers. Each card comes with a minimum of 2 analog I/Os plus MIDI. Add-on breakout boxes are available that support up to 36 analog or digital I/Os per card. Now for the bad news: The current version is Windows-only. The system supports Windows Multimedia drivers (Audio + MIDI) as well as ASIO drivers with fast ‘in hardware’ support. Scope devices donÃƒÂ¢Ã¢â€šÂ¬™t operate like traditional VST or DXi plug-ins: they can only run on Scope hardware and are patched into your sequencing package through a sometimes-confusing ASIO / MIDI patchbay. That said, some Scope effects and instruments can be used in a special XTC ÃƒÂ¢Ã¢â€šÂ¬Ã‹Å“hostÃƒÂ¢Ã¢â€šÂ¬™ mode that makes them appear as VST devices within your favourite VST-compatible sequencing package. 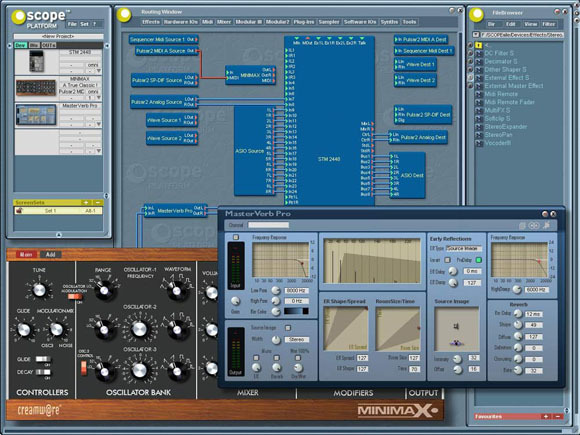 Creamware went through a rough patch in 2005 and reorganized to focus on a new line-up of virtual analog synthesizers based on their popular Scope algorithms. It will be interesting to see whether the Scope cards will be updated to work with Microsoft Windows Vista when it is released in early 2007. 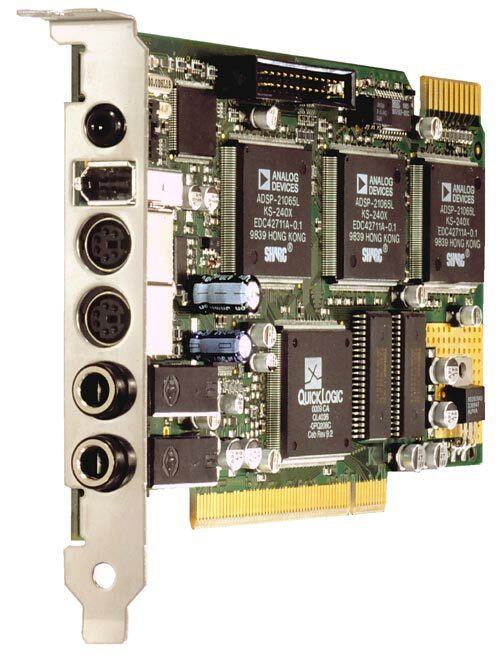 In any case, a Scope card or two can add significant possibilities to a maxed-out music production system. Just be sure to purchase a software upgrade to thank the Creamware team for helping you to complete your magnum opus.